(CNN) Despite a half-dozen warnings from National Security Council officials about the ethics and legality of a proposal to export nuclear technology to Saudi Arabia, White House officials continued to push for it in the early months of the administration, promoting a lucrative project backed by former National Security Advisor Michael Flynn, according to a new report from congressional Democrats. The report says Harvey overrode staff warnings and promoted the nuclear project pitched by IP3 International, a private company founded by former US generals. Flynn previously advised an IP3 subsidiary, IronBridge Group. The Democrats’ report also claims that Flynn’s deputy, KT McFarland, continued to raise the proposal even after these warnings, triggering career officials to report her comments to NSC lawyers. Flynn has not immediately responded to CNN’s request for comment. Flynn’s involvement in efforts to broker US-backed nuclear development deals with Saudi Arabia have previously been detailed. However, the Democratic report provides information from whistleblowers describing how one of these proposals circulated among Trump’s newly-minted national security appointees at the White House, and the extent of the internal handwringing by career NSC staff and legal officers who tried to shut down the project. ProPublica previously reported that NSC staff were concerned the plan was bypassing the process but its advancement continued despite the objections. Cummings’ staff undertook an investigation when they were in the minority but did not have the support of Republicans to formally investigate and could not subpoena many of the entities and individuals involved for documents. Almost immediately after Trump took office, Cummings started looking into Flynn’s dealings on similar Middle East nuclear projects and was able to obtain some documents from companies with ties to Flynn. The Trump administration’s relationship with Saudi Arabia has drawn scrutiny because of the President’s personal business dealings in the region and the President’s refusal to accept his intelligence community’s findings on the murder of Saudi journalist Jamal Khashoggi. The report alleges, beginning the week of the inauguration until early April, that staff on the National Security Council repeatedly raised concerns about the project to Harvey and NSC ethics and legal officials citing conflicts of interest and the potential circumvention of the Atomic Energy Act, which limits the transfer of nuclear technology to a foreign country without the approval of Congress. Harvey, despite these warnings, repeatedly pushed the plan, telling the staff that Flynn wanted it included in the President’s talking points for a scheduled call with King Salman of Saudi Arabia, the report said. That was one of several memos, released Tuesday by the Democrats, that was written or signed by IP3 co-founder Robert “Bud” McFarlane. He previously served as President Ronald Reagan’s national security adviser and pleaded guilty in 1988 to withholding information from Congress as part of the Iran-Contra scandal. A spokeswoman for IP3 declined to comment. Representatives for McFarlane did not immediately respond to CNN’s requests for comment. The White House has not immediately responded to CNN’s request for comment. IP3 officials were actively soliciting the administration and provided to Flynn a draft memorandum describing the program that is included in the Cummings report for him to submit under his name to Trump. The report goes on to say IP3 also provided another draft for Trump to sign directing relevant cabinet officials and agency heads to express their support for the plan. The memo noted that Tom Barrack, a long-time friend of Trump’s and private investor close to Gulf countries, wanted to run the plan and that Rex Tillerson, then secretary of state, and James Mattis, then-defense secretary, were “supportive of Tom’s focus on this also,” according to a draft memorandum included in the staff report. Neither Tillerson nor Mattis has immediately responded to CNN’s request for comment. When Flynn sent the packet to White House staff directing them to “prep a staff packet to go to the POTUS,” NSC staff again raised concerns about the potential financial benefits to Flynn’s former partners and to Barrack, the report said. Eisenberg later told the NSC staff, according to the report, “We don’t need to do anything else about this.” He added, the report said, that McFarland, then the deputy National Security Advisor, agreed there would be no further action on the plan. McFarland left the White House in May 2017. However, despite the multiple warnings, talks continued on the proposal even after Flynn was fired in mid-February 2017 for lying. IP3 reached out again to Harvey with an email dated March 4, saying, “We’re very close to losing our position in the Middle East,” according to email included in the report. Those concerns that the plan was still being discussed were raised again with Eisenberg who promised to investigate. The staff’s concerns were amplified after Trump met with Mohammed bin Salman, then the deputy crown prince of Saudi Arabia. In a read-out of the meeting, Harvey referenced a “new United States-Saudi program,” prompting the unnamed senior official to ask the NSC staff, “What the hell is going on?” according to the report. Harvey subsequently held a call with Barrack and his consultant at the time, Rick Gates, to discuss the plan, the report says. Gates, who was Trump’s deputy campaign chairman and a longtime business associate of Paul Manafort, has pleaded guilty to financial fraud and is cooperating with special counsel Robert Mueller’s investigation into Russian interference in the 2016 election. Harvey was trying to promote the plan “so that Jared Kushner can present it to the President for approval,” according to the report. Neither McFarland nor Gates immediately responded to CNN’s request for comment. 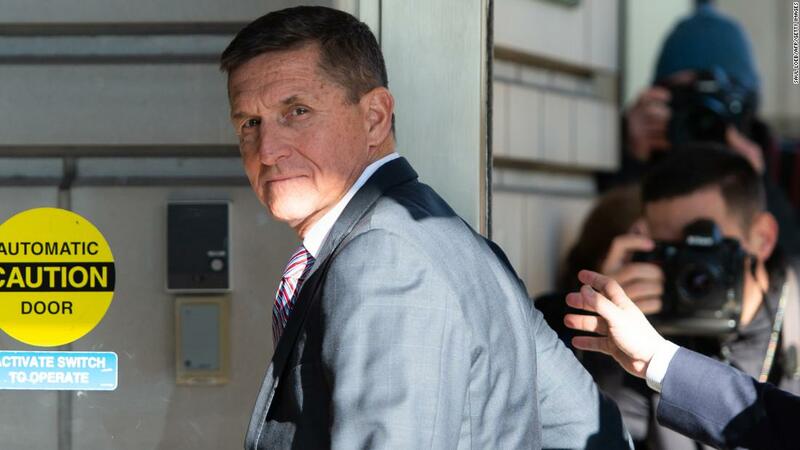 The involvement of Flynn and Gates, as described by the Democrats, raises questions about whether they provided Mueller with any information about the project. Both men have cooperated extensively with Mueller’s investigation, which has explored a host of issues beyond Russian election meddling. Retired General HR McMaster, after he replaced Flynn as national security adviser, told the staff that, “John (Eisenberg) and I agree that this is done. Nobody should work on this anymore,” according to the report. But the report says the matter still didn’t end there. The State Department, where Thompson now works, has not immediately responded to CNN’s request for comment. Langer did not answer detailed questions about Harvey’s role the Saudi plan and whether he ignored warnings about it. McMaster resigned in March 2018. He has not responded to CNN’s request for comment. Rick Perry, Trump’s Energy Secretary, has revived talks about nuclear cooperation, telling Congress in May 2018, “[W]e tried to really drive home to the crown prince … that if you want the best reactors in world, you have to come to the United States and you have to use Westinghouse.” Westinghouse was acquired by a subsidiary of Brookfield Asset Management in early 2018. Brookfield took over a lease of Kushner’s troubled 666 Fifth Avenue office tower. Representatives for Kushner did not immediately respond to CNN’s request for comment.